Back cover blurb: Her heart died in the war – can she breathe new life to it? Dora Simon and Joe O’Cleary live in separate countries, accepting of their twilight years. But their monochrome worlds are abruptly upended by the arrival of Barbara Hummel, who is determined to identify the mysterious woman whose photograph she has found among her mother’s possessions. Forced to confront a time they thought buried in the past, Dora and Joe’s lives unravel – and entwine. For, trapped on the Channel Islands under the German occupation in the Second World War, Dora, a Jewish refugee, had concealed her identity; while Joe, a Catholic priest, kept quite another secret... This is a story of love and betrayal, shame and survival. But can a speck of light diffuse the darkest shadows of war? 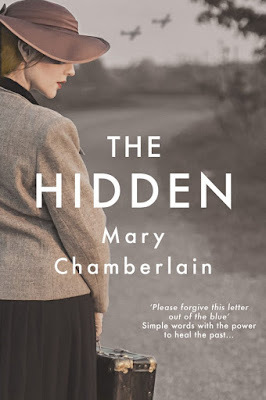 For me, The Hidden is a bit of a slow burner of a novel, it probably took me until around half way to get totally absorbed in it, and then I couldn't let it go. This novel opens in 1985, where Dora Simon and Joe O'Cleary are living in separate countries, unaware that their paths are about to collide, and unaware that they passed before, during the Second World War when they were both living in Jersey under German occupation. We are then transported back in time to occupied Jersey, where we learn that Dora is a German Aryan Jew, hiding under the guise of a Swedish Aryan. Dora is a midwife, though she dreamed of becoming a Doctor. Through the tragic death of his daughter, and her stillborn child, she meets Geoffrey, the man she knows she wants to spend the rest of her life with. Geoffrey is a social outcast and Dora is warned off him several times, though she is never given any real reason for this. Joe O'Cleary is an Irish priest, hiding a terrible secret of his own. He is a keen amateur boxer, and bird watcher, and it is through the love of the latter that he meets Trude a German nurse. Both Dora and Joe know that they shouldn't be putting themselves in the danger that they are by falling in love with those who are deemed unsuitable for them, particularly during wartime. But it is precisely during the wartime that these usually forbidden relationships seem to blossom, as people fear for their lives and their families. The Hidden is a beautifully written novel, and has real as well as historical figures within it's chapters. The story is much more than I have detailed above, but much like the characters themselves, I believe that each reader will go away with their own version of this story. The Hidden is available now via Amazon online and all good book shops.